That’s a good question. You basically need to start with something that makes a mark on a surface. If you’d like to smoosh a leaf on paper and make a lovely green design, then go ahead, have fun! It’s all good. 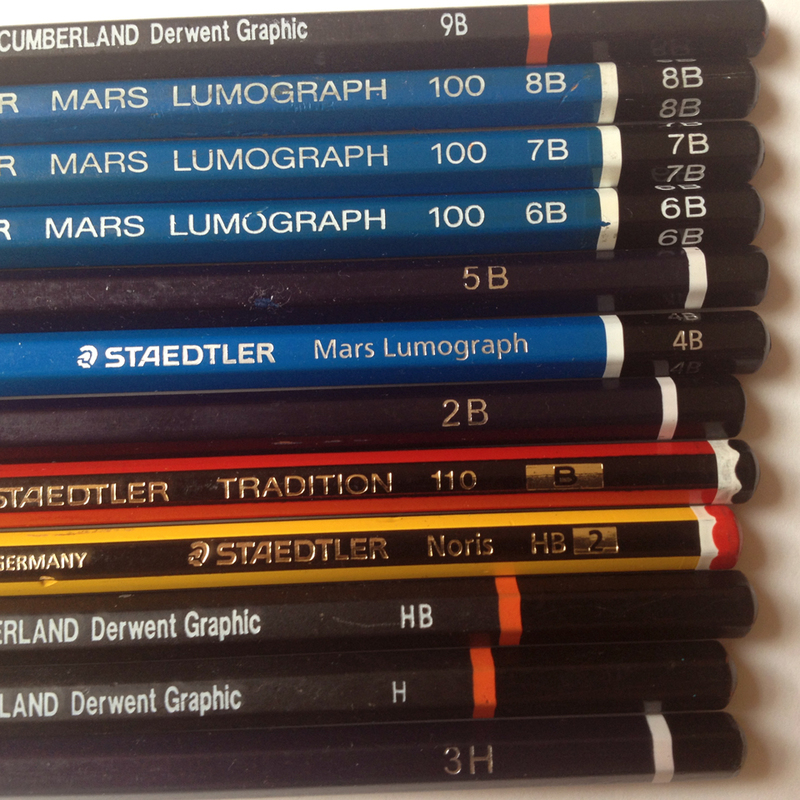 Pencils come is various hardnesses. (meaning they make sharper or softer lines, and either don’t smudge under your fingers or smudge stick, or vary in their smudgenosity from just barely smudgy to super duper better not even touch the drawing smudgy. The harder ones are marked with an H and then a number in front of the H. The higher the number, the harder the lead. The ones you probably wrote in elementary school with are marked with an HB, and the softer smudgier ones are marked with a B and then a number behind the B. the higher the number, the softer and smudgier the lead. 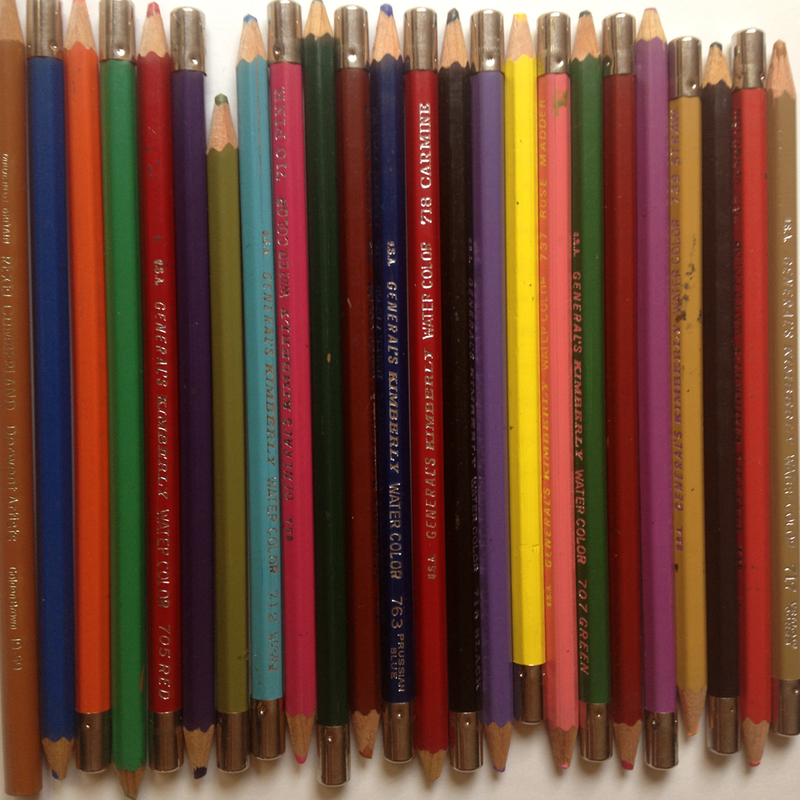 Pencils also come in all sorts of colours and all sorts of qualities. Art store pencils are superior to dollar store pencils for colour and softness, but are also more expensive. Hound your favourite art store for sales, or, in North America, grab one of those perpetual Michael’s 40% off coupons. Michael’s carry lovely art pencils. 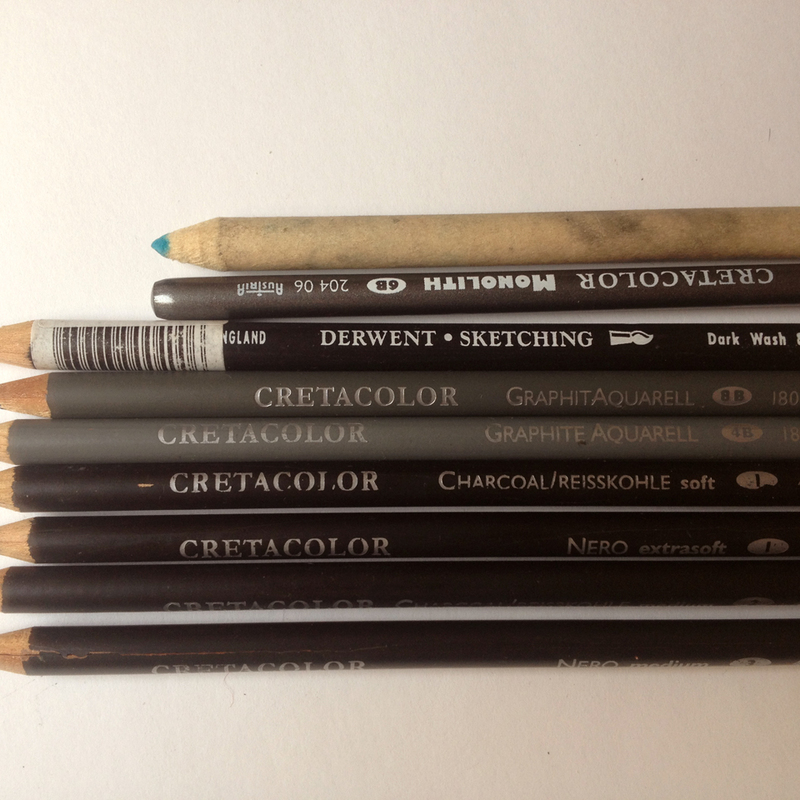 Some pencils are watercolour pencils and can be beautifully blended with a wet brush. Some pencils are extra soft charcoals which can be smudged with your fingers or a smudge stick, or water soluble charcoals which can be blended with a wet brush. 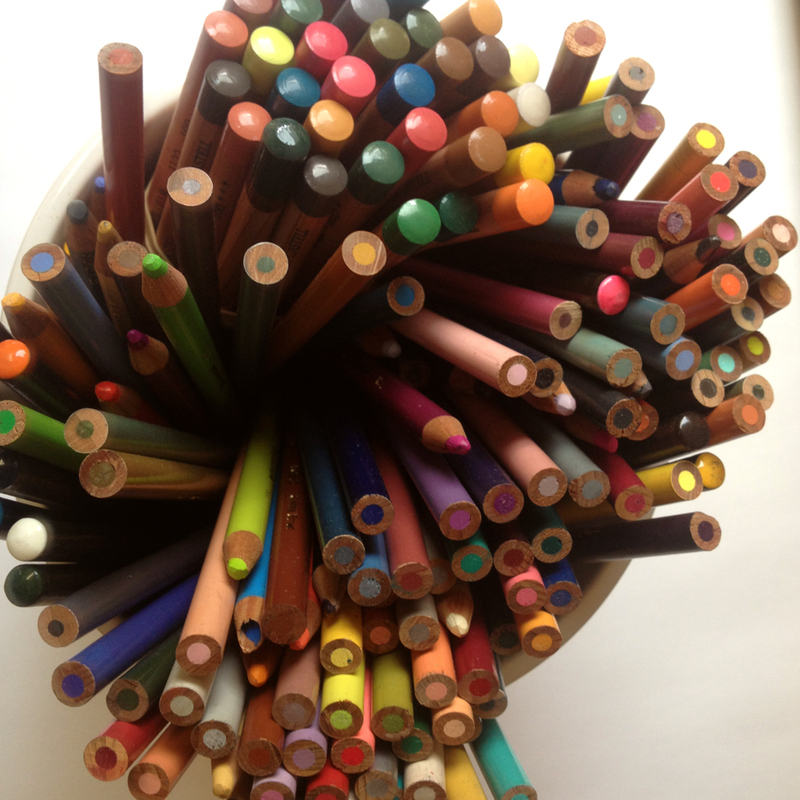 – This might seem obvious, but never rinse your pencils or immerse them in water. The wood will swell and the colour might melt depending on the type of pencil. 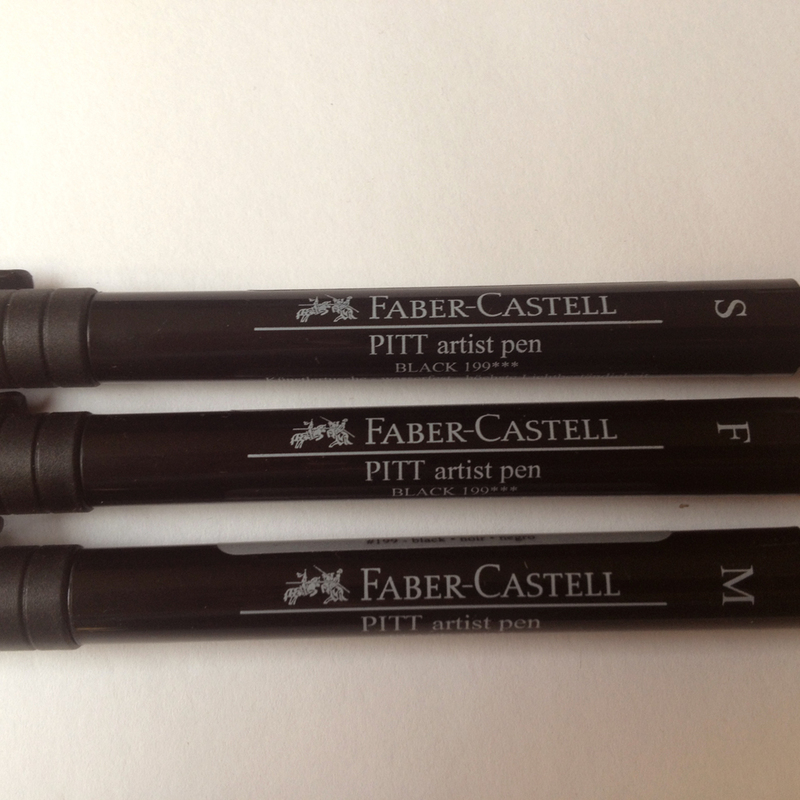 – Take care how you sharpen your pencils. Never sharpen from the end which gives the colour name or hardness! I love to draw with pens. – put the cap back on…they dry out. – some are permanent, some will smudge, some will blend with water, (mostly all will smudge or blend on the paper if the ink is wet). – mostly, once you make a mark with a pen that’s it, you’re committed to that mark. Pastels are sticks of pure pigment held in a medium of some kind. 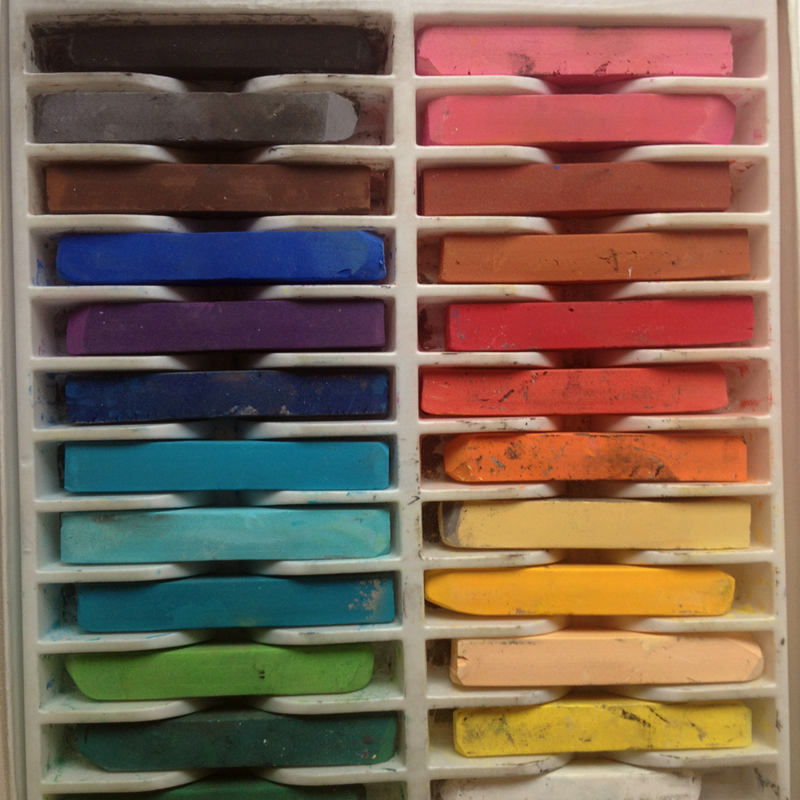 These are chalks but they also come in oils, water soluble mediums, harder or softer mediums…there are all sorts of pastels out there to chose from. My favourite are the chalk pastels. They are intensely easy to draw with and blend, and simply get all over your fingers, clothes, your desk…your nose, your children, your cat… They are a fantastic pure hit of colour and light for your art. When you finish with chalk pastels you need to spray a fixative on your drawing (more about that later) to prevent it from smudging. Oil pastels are buttery soft and a pleasure to draw with. 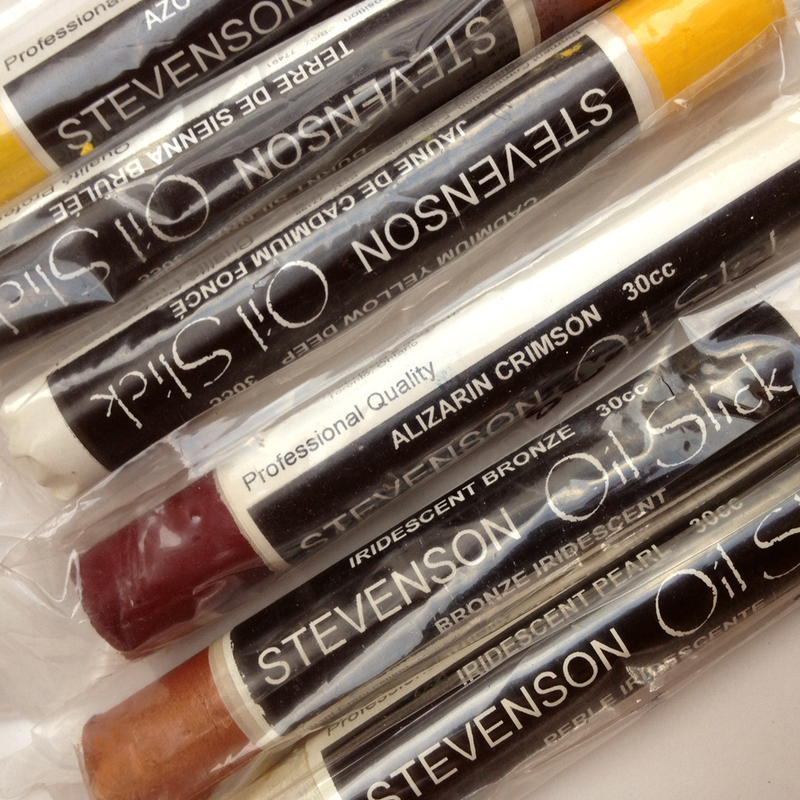 They are harder to blend than the chalks, don’t require a fixative, and give intense colour. – take care to put them back into their box in the separate slots, or use some other method of keeping them apart. They will rub off on each other and you’ll lose that pure, clean colour. If they do, they are easily wiped clean…but why make more work for yourself? – while drawing, try to wipe your hands on a piece of towel between colours. Now let’s look at brushes. 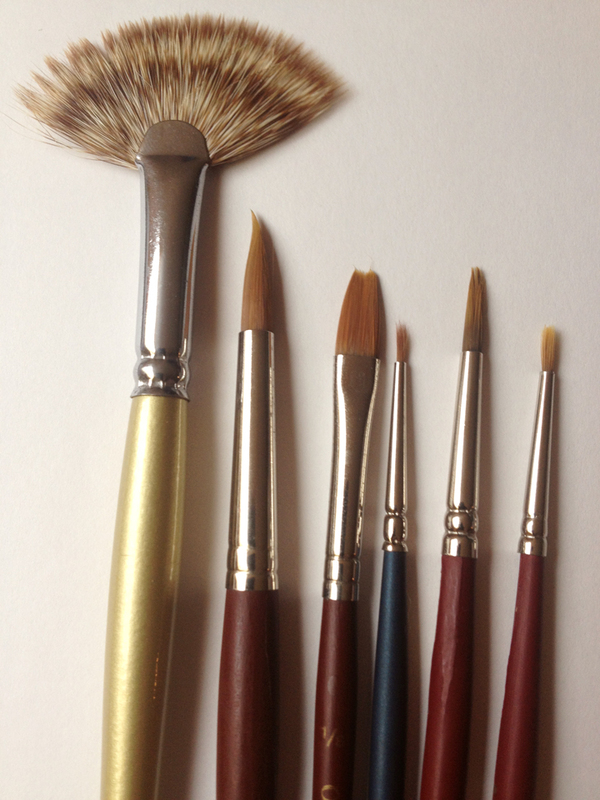 Brushes are made to be used with specific paints and they come in so many sizes it’s mind-boggling. Just one trip to an art store can send you running for the hills and vowing to take up golf instead. But let’s break it down a little. Say you want to use watercolours. 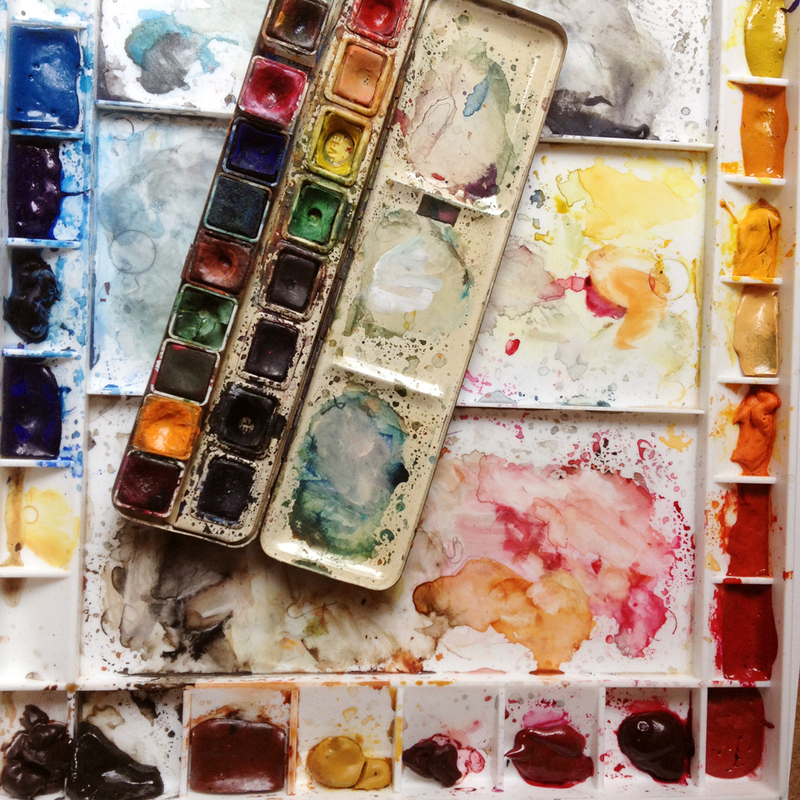 Water colour brushes are super soft and usually made from soft, natural materials, and are designed to hold pigment and water, and flow that watery pigment nicely and evenly on your paper. They usually hold a fine point and are brilliant for precise lines. Go touch and feel some. Bet you can’t resist stroking them on your hand…or, if you’re like me, on your cheeks. They are also the most fragile of your brushes. 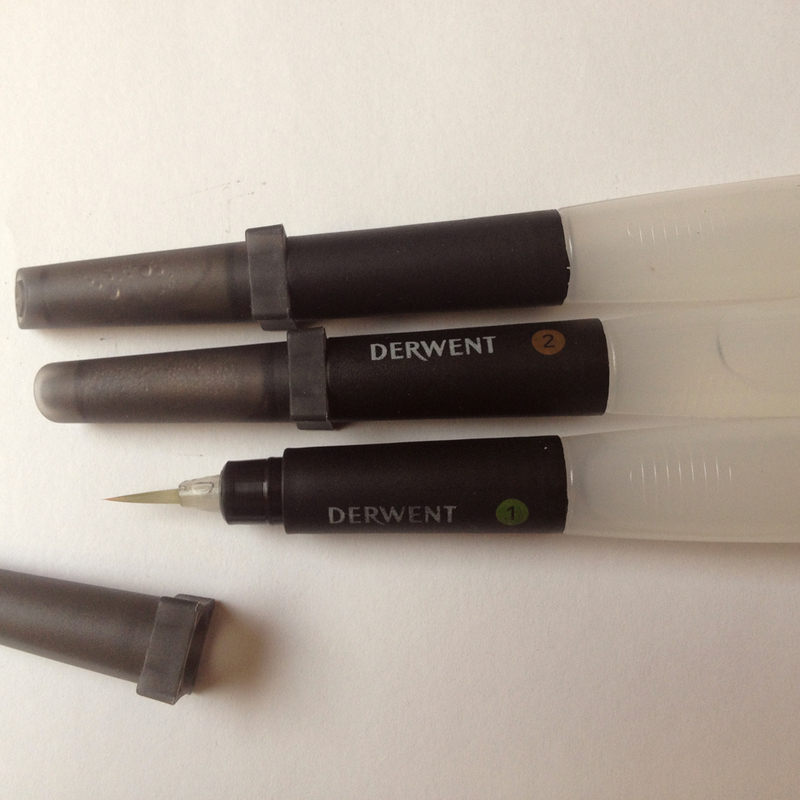 Some lovely, new watercolour brushes have their own water supply right in the handle. I love these! Say you want to use acrylics or oils. These are acrylic and oil brushes. Some people argue that acrylic and oil brushes are different species and I say that’s nonsense. These kinds of brushes are both made of harder, more bristly stuff because they are meant to push around globs of viscous material and not gently float watered pigment. The only difference between using the brushes with the two mediums is that acrylics you will thin and clean with water and oils with solvents. – good brushes are expensive OMG! Take care of them. 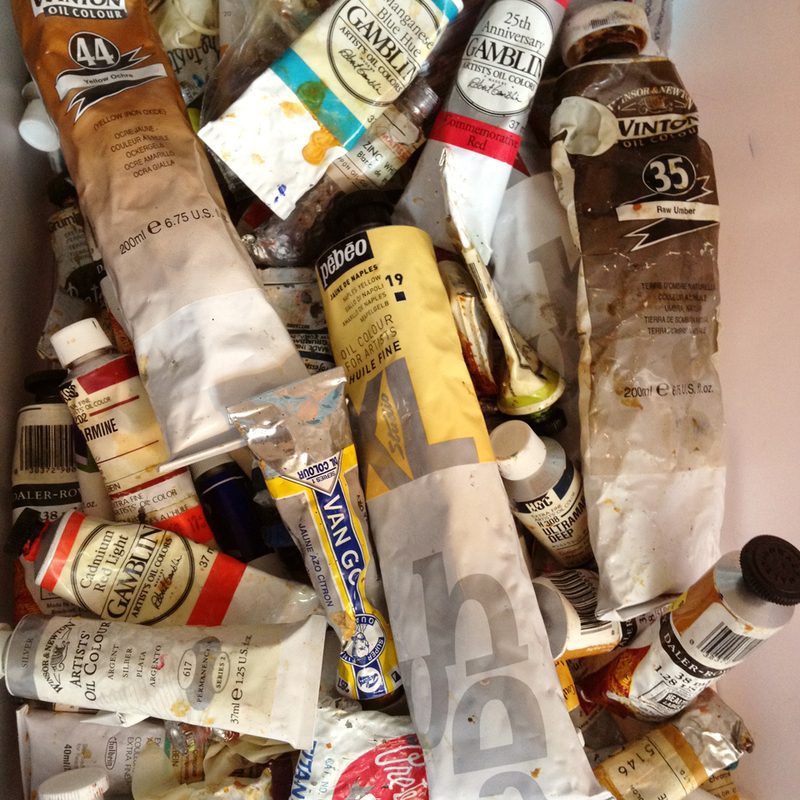 – you can try, but you probably will have a super hard time trying to paint in watercolours with oil or acrylic brushes and will probably take up golf if you try to paint oils and acrylics with watercolour brushes. – never leave brushes standing bristles down in your water or solvent jar. – never leave the studio for the day and forget to wash the brushes out. – the best way to wash brushes, I found, is to pour a small puddle of dish soap on the bottom of the sink, push the dish soap around with the brush making a nice lather, rinse, rinse, rinse with clean water and wipe in a paper towel. In my experience, at the end of my painting session, dish soap will clean oil paint out of brushes just fine. – people say you should try to avoid standing brushes up to dry because water shouldn’t get into the ferrule (the silver part holding the bristles together) Bah, who’s got time to balance brushes on their sides all around the kitchen sink. 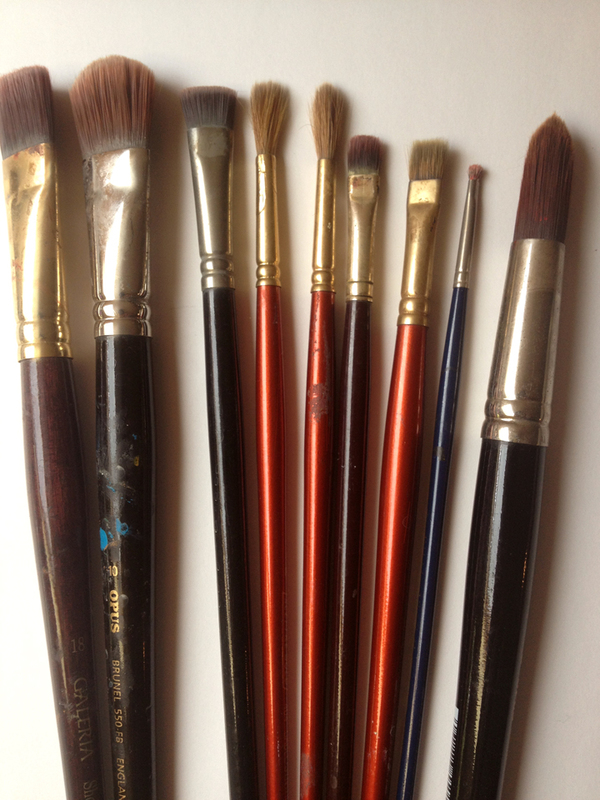 I have brushes which my late aunt handed down to me that are about a million years old (slightest exaggeration but I’m pretty sure dinosaurs were alive then), and are just fine after having been stood up to dry over those million years. Some other fun things you might like to have on hand. A black and a white ink are great to have on hand. Black watercolour isn’t very black actually and pens can’t give you a satisfactory large swath of black, but black ink is the blackest, loveliest black around. I flows beautifully with watercolours and has that wonderful “I am the night!” quality. White ink is…well obviously…white. In a watercolour world, white is often lost under the colours and washes and sometimes white is so welcome back. White ink does the trick. 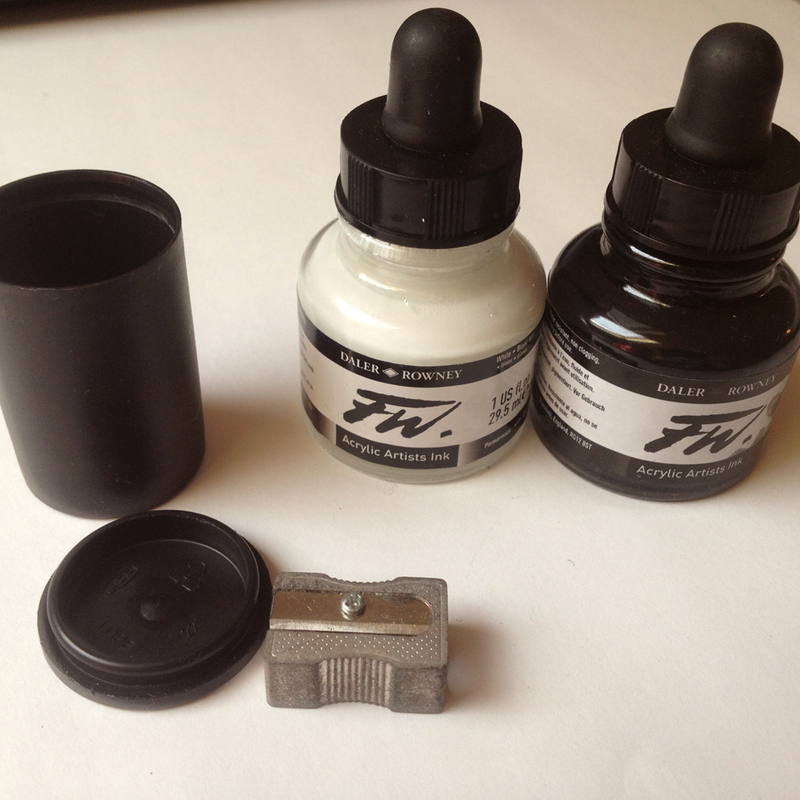 A good sturdy sharpener is essential, and an old fashioned film canister holds a small, but adequate amount of water and doesn’t spill when you’re out and about. It can come in tubes or in little pots. 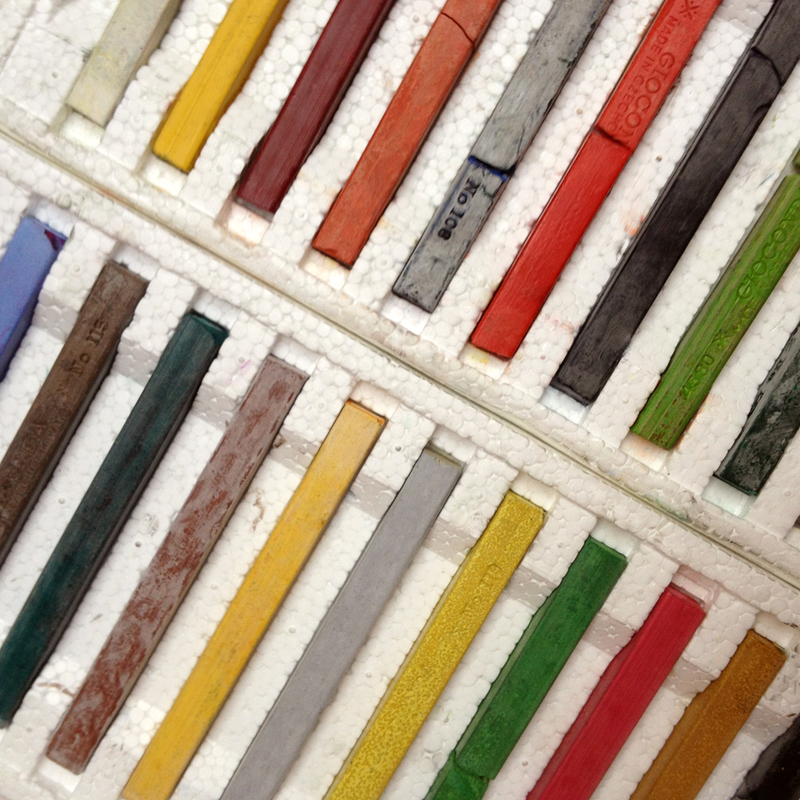 In tubes, the whole tube gets squished out inside a pallet and the paint is left to dry. My pallet is a generous one with loads of mixing area. I occasionally take a wet paper towel and clean off the mixing area, but rarely. Watercolours are really good value because they last and last…like forever. You can paint your little heart out with watercolours. 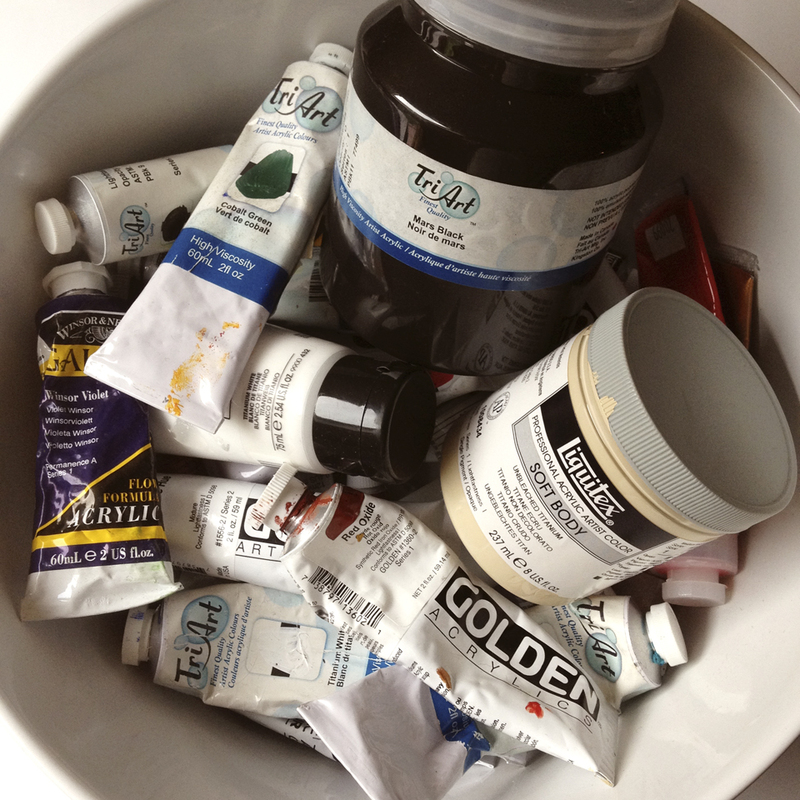 Acrylics come in tubes or pots. Acrylics get used up very quickly and so, after a while, you figure out that the pots are a much, MUCH better value than the tubes. 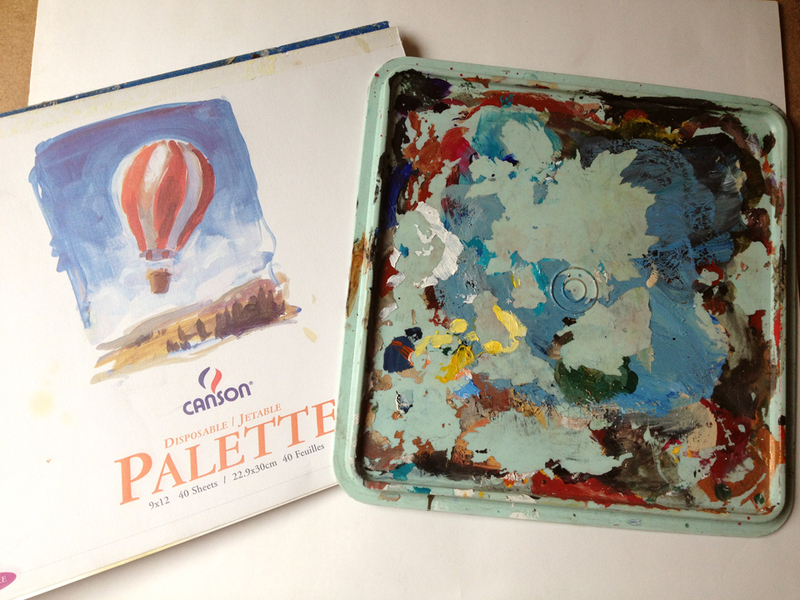 My acrylic pallets tend to be the plastic tops from broken Tupperware containers. The dried-on, left-over acrylics peel off the plastic really easily, (and, bonus, make brilliant little details for collages). Oils always come in tubes. Usually smaller tubes are fine because oils go a long way. Oils don’t really dry. I mean, they do dry to the touch after a few days, but continue to dry, chemically speaking, for years to come…like really years…some people argue that some old masters paintings are still drying. 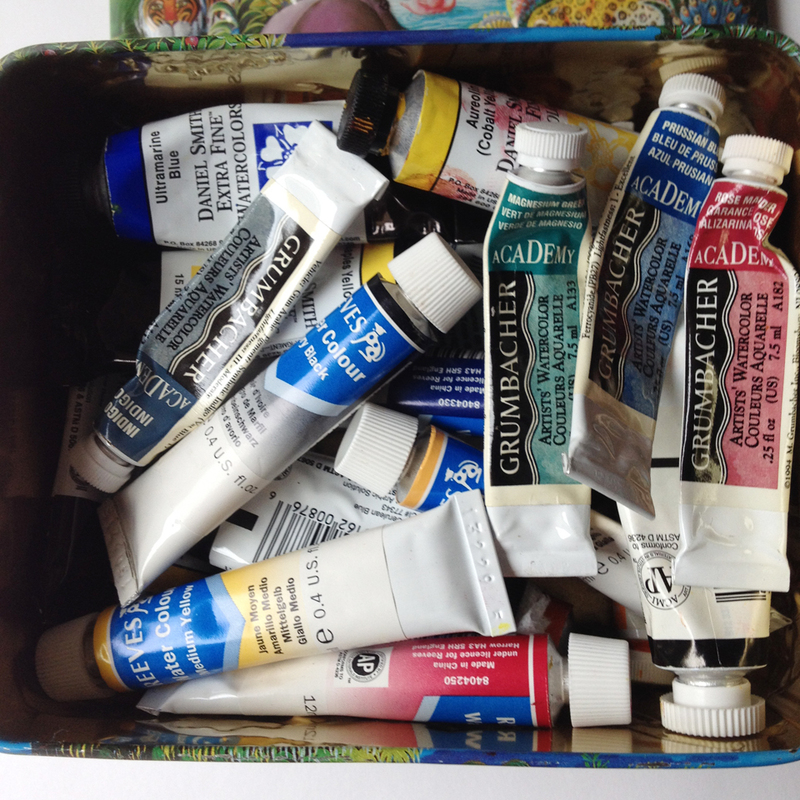 In my collection are oils handed down from my late aunt, (who painted when dinosaurs were roaming the Earth…remember? ), and I still use them. Oil paints are oil paints to me. They need to be cleaned with turpentine. I don’t really go for the kind which can be cleaned with water. I’m prejudiced like that. My oil pallets of choice come in wax paper forms. I love that I can tear off the used sheet and be done with it. I’m not a consistent oil painter and switch up the colours as I feel like it, so having blended mud on my pallet isn’t my idea of fun. Ok, this is where I will tell you about the obvious and traditional things to draw and paint on, which include paper, canvas, and smooth wooden supports, but actually I think you should paint on whatever you want. For me that includes: eggs, clothes, bark, driftwood, the sawn off end of the Christmas tree…practically anything. For my friend Julie, snails in her garden are fair game. But let’s talk about traditional stuff. Oh I know, where do you start? There are practically as many types of papers as those brushes we talked about, and trying to understand them all will make you take up golf. 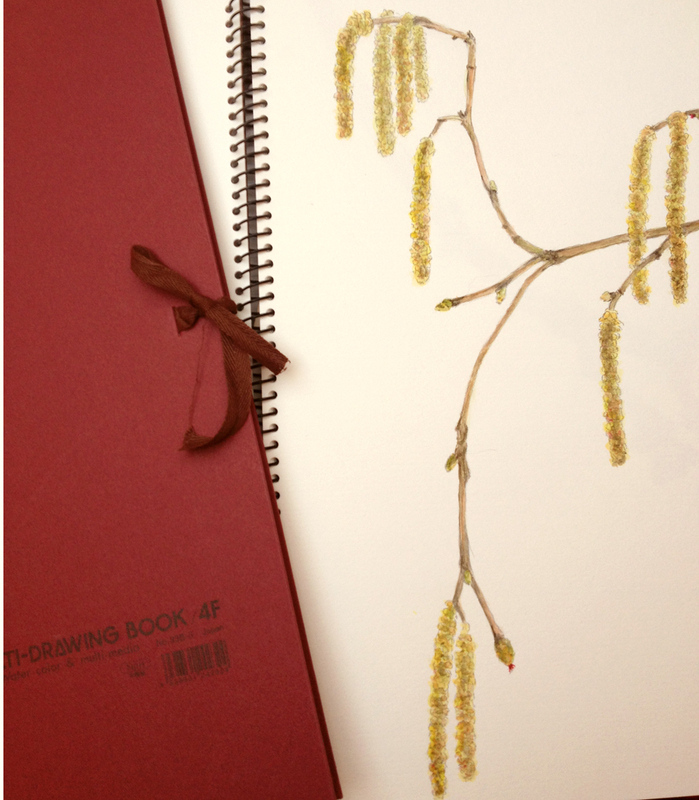 It’s probably best to start with a good quality sketch book. Chose a Goldilocks one, (one that’s just right). Look at your options in the art store, (not Walmart). Feel the pages, turn them over, feel the binding, read the description, look at the size, fit it into life and fit yourself into its pages. This is really important because a sketch book is a very personal thing. Too big and you’ll be afraid of all that page whiteness. Too small and it’ll frustrate you. Poor quality and water will warp the pages and soak thru to the next one. Chose wisely young grasshopper. On the other hand, sketch books are relatively inexpensive and you can hand it down to a friend or leave it on a street corner for someone to find and go buy a new one. Once you get the hang of paper, you might like to buy the kinds of sheets you prefer as loose sheets. They don’t have a million pages, so are easy and satisfying to fill up, and they are sturdy enough for watercolour, collage and even oil, (although I do take risks). I also love the little ribbon tie. Canvases are also relatively inexpensive and come in a myriad of sizes. Some are deep walled, some are shallow walled, but the cheapest and easiest kinds are canvas glued onto a hard, thick card paper back. Those are just fine to have some fun with. So, if you want to glue stuff down on paper or thin acrylics or oils, blend the paints without making them watery, get into all that artsy stuff, you’ll need a medium or two. 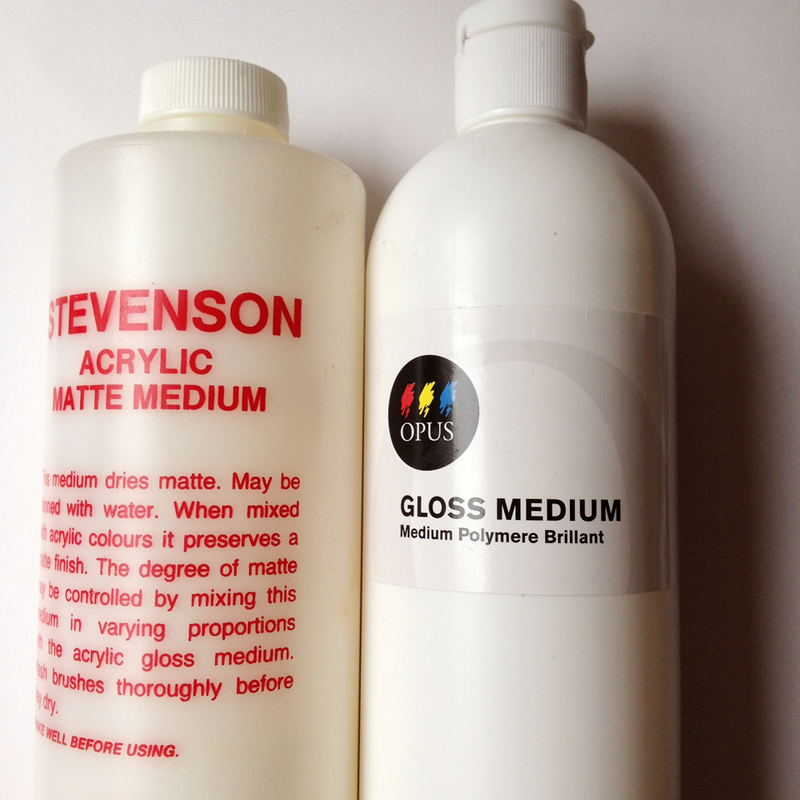 The best all purpose paper and acrylic blend/glue-all to have around is acrylic matte medium. Matte because it won’t dry shiny and tacky, medium because it won’t break down the integrity of the acrylic paint on the canvas. This stuff is basically the same stuff that holds all the pigment together in the tubes except it’s colourless. The other one I have around is Acrylic gloss medium. What can I say, my grandmother used to say I’m half magpie because I like shiny. 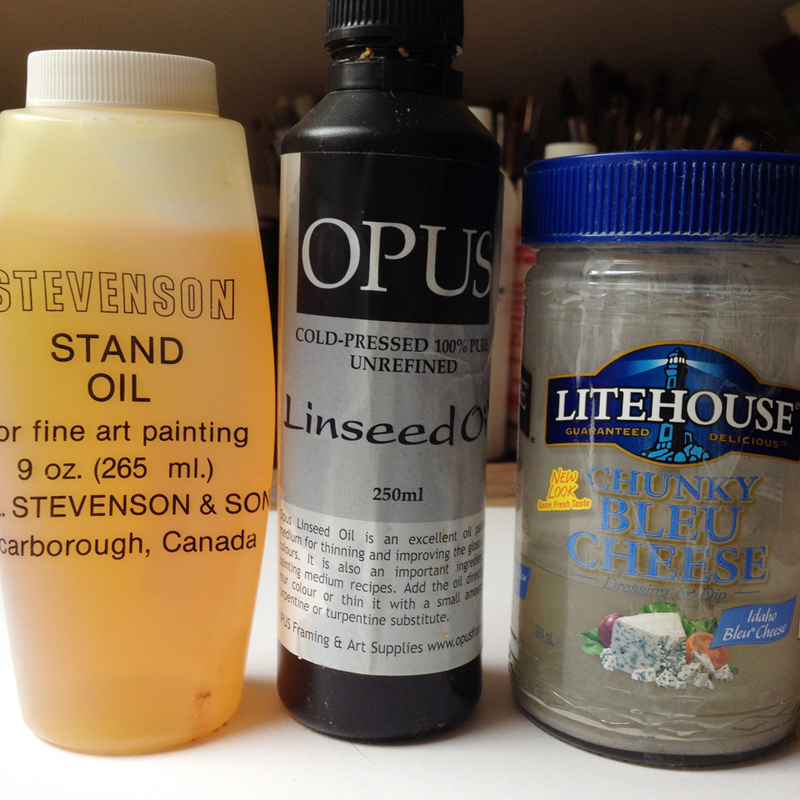 Stand oil (which is linseed oil anyway, just thicker), linseed oil and blue cheese salad dressing a container to hold a small amount of turpentine in. The oils improve the flow of the paint and the turpentine cleans up the mess. I do have to warn you here. I really love the smell of oil paints and really love the smell of turpentine. It reminds me of happy times, of my childhood, of sitting on the floor of my aunt’s studio watching with big eyes as she painted, and of eventually being allowed to paint on those canvases. Of a time when everything was ideal and happy and shiny. But I do understand that turpentine gives off noxious fumes and there are much healthier odourless mineral spirits available which are just as good and I’m fine with using those too. 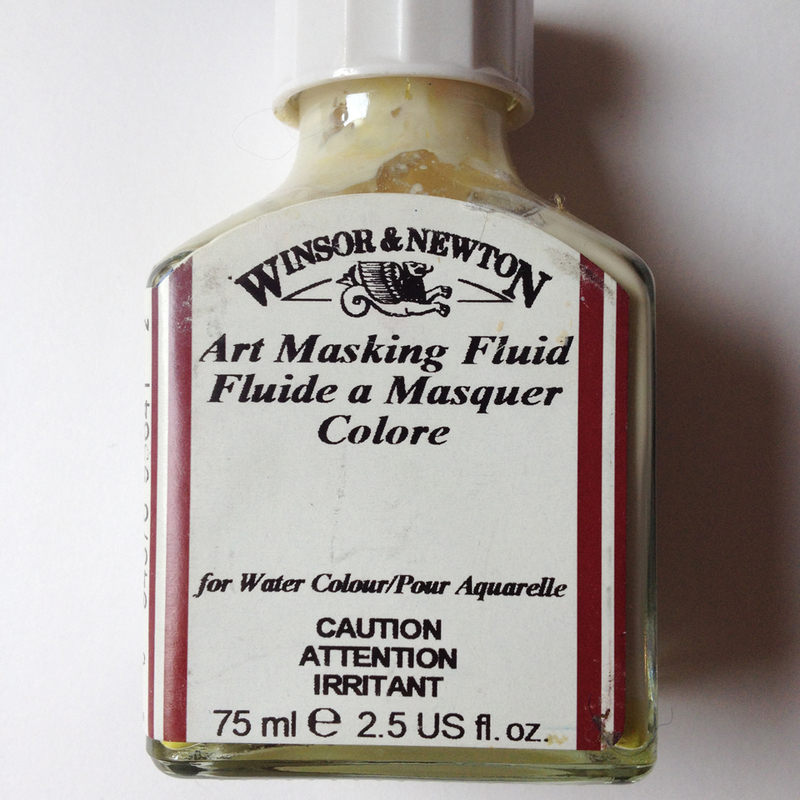 This stuff is masking fluid for watercolours. Oil sticks…no idea what I was thinking. 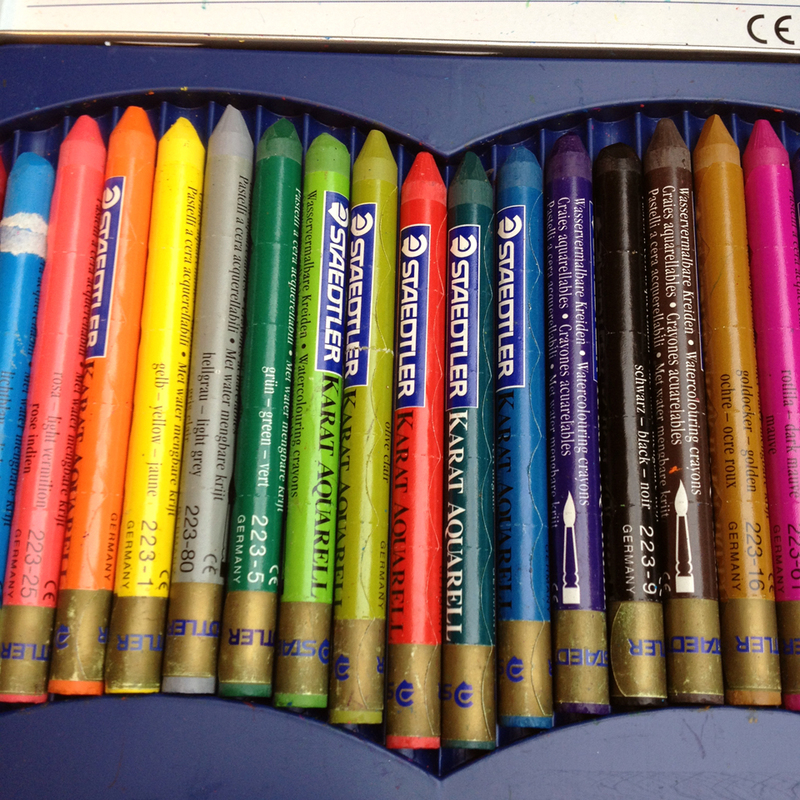 These things are billed as “artists’ oil chalks“…what? They are hard, they break and are generally pretty miserable to play with. Watercolour crayons. Yup, pass them on to the next five-year-old you see.